May.19.2015Drag School Beats Texas Storms! Last week the state of Texas and the Houston area in particular were drenched by pounding rains for several consecutive days with accumulations of up to 10 inches of water in some areas. 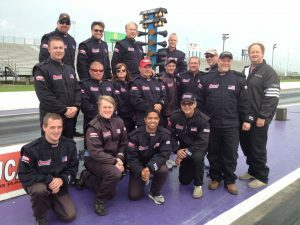 But the Frank Hawley Drag Racing School students didn’t miss a run down the Royal Purple Raceway 1/4 mile in Baytown TX. The school’s group of drivers ranged from locals, like Sherriff’s deputy Greg Brockett, to Gifford Hill whose friends Richard Hale and Lance Wells made the trip from Alaska. The drivers completed an incredible 115 runs during the competition course and those results produced 18 newly licensed NHRA drivers! 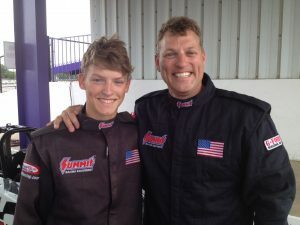 In addition to the competition course others competed in the Dragster Adventure program which allows drivers to do some “side-by-side” dragster racing. Kendall Levron from Houma, LA was the Challenge winner with Avery Smith from San Antonio, TX as runner-up! So with the Houston classes in the books the school is back in Gainesville this week for some Nostalgia Funny Car classes. If this sounds like something you’d like to try, check out our classes coming up in Gainesville, Denver, St Louis, Norwalk, Reading, and Fontana.